I am a self taught photographer living in an area of Norfolk known as The Brecks and have the whole of Thetford Forest on the doorstep. I have lived in Norfolk for 20 years and think of it very much as my home. I only picked up a camera a few years ago, starting with a cheap camera converted to infrared as I liked the other worldly look of the images it produced. I now use Panasonic Lumix cameras' as I find them small enough to carry easily while out walking, one of which is converted to infrared. I do most of my photography while out walking my two dogs and love finding the smaller pockets of old forest among the pine trees. I like to photograph the natural world and especially in a creative way. In the past few years I have been very pleased to have images shortlisted in Wildlife Photographer Of The Year, Outdoor Photographer Of The Year, Landscape Photographer Of The Year and Black and White Photographer Of The Year . I have also had a number of images published in photography magazines. In February this year I was excited to find out that my hive image received 3rd place in the Captured at Kew category of the International Garden Photographer Of The Year awards series 11. 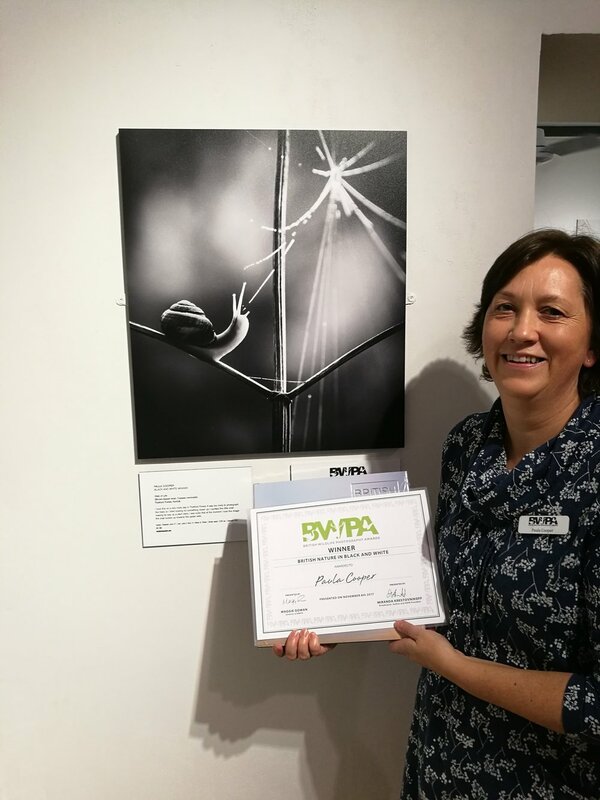 I also received 2 awards in IGPOTY 10. I was delighted that last autumn my image, web of life (snail) won the black and white category of the British Wildlife Photography Awards 2017. It was exhibited at the Mall galleries in London (now on tour round the UK) and also published in their book. I hope you enjoy looking at my images and please do not hesitate to contact me if you wish to order any prints.